The most special day of the year is approaching—your child’s birthday! Leading up to the big day, your little monkey gets incredibly excited, and you ponder how to make the day extra special this year. So why not bring the zoo home, and host a theme party with a difference! It goes without saying, but the first rule is: Follow your child’s preferences. Anything is possible, whether they like pirates, unicorns, dinosaurs, Disney, or simply the color red—with a bit of creativity, any theme can be turned into a party to remember. The birthday cake is one of the most important parts of any birthday party. If done right, it can bring a smile to all party guests. There are several ways to bake a fab theme-cake. You can use a shaped baking mold or work with royal icing and gum paste to create edible cake decorations. Alternatively, you can use non-edible decorations to enhance your cake, such as candles, cake topper picks, or make your own flags and bunting with wooden skewers and craft paper. These options cost little money and make a big impression. 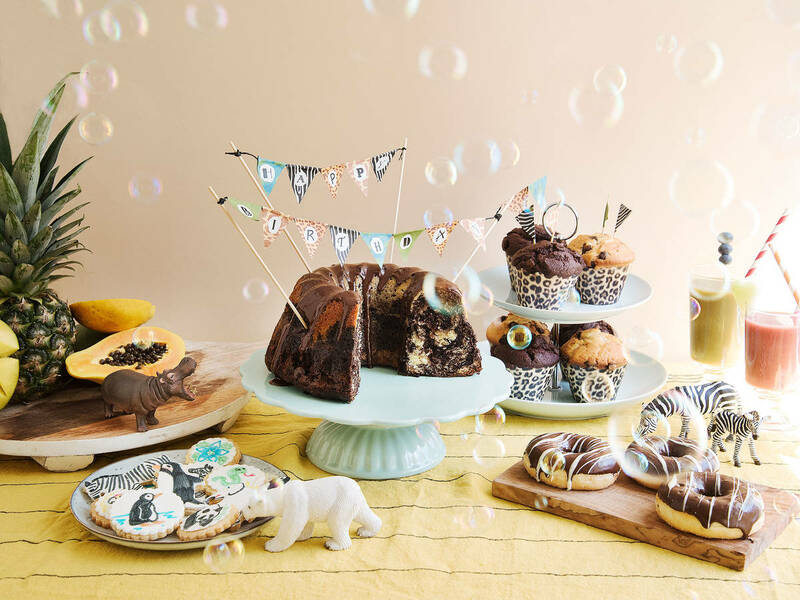 If you want to go the extra mile, you can pattern your cake batter, like in this zebra bundt cake, or our Smarties cake, which is just perfect for a zoo themed birthday bash. Thirsty little explorers will appreciate an exotic selection of drinks at your zoo party, such as this Safari smoothie. Serve a selection and decorate with fun straws for a more colorful presentation. If you’re also going to serve hot lunch or dinner at your party, think about something a little more exotic, like this coconut-crusted cod with banana leaves, or carrot hummus with pita bread. If you’re serving more sweet delights like donuts and cupcakes, a simple trick to dress them up is by covering them in a chocolate ganache and adding some white chocolate “zebra stripes,” or work with edible sprinkles. An exotic fruit platter will offer a healthier alternative. You can use special cookie cutters to stamp out zoo-themed melon, papaya, and kiwi shapes. There are a lot of party decorations that you can purchase on the cheap in discount stores or online, such as balloons, table runners, cupcake wrappers, or paper cups and plates in zebra, leopard, and many other animal patterns. Even confetti is available in awesome animal shapes nowadays. You can, of course, also make those yourself, or with the help of your kids. A themed birthday party is all about the right types of activities to keep the children occupied. Many popular kids’ party games can be adapted for your theme. You can organize a scavenger hunt by hiding little zoo animals or play musical chairs with animal songs. Charades are a lot of fun with animals to act out, and face painting is always a winner. Craft activities are great to calm the kids down. Why not make some “animal food” bags with them—goodie bags that they can take home afterwards! You can use simple lunch paper bags and get the kids to decorate them with “Monkey Munchies,” “Elephant Food,” and “Zebra Snacks,” then fill them with candy. They will enjoy this even more if they make the snacks themselves. Our muesli energy bites, for example, don’t require any baking, and animal-shaped butter cookies will make cute snack bag fillers. These can be colored in with edible food markers. The kids will love it! Let us know which theme party you would like to host, and share your photos and ideas in the comments below!